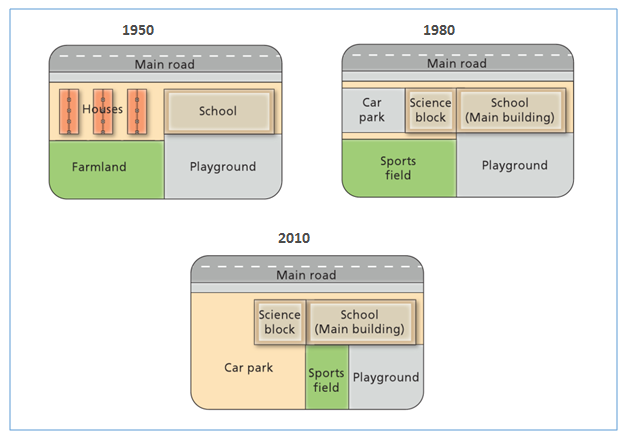 The diagram shows the changes that have taken place at West Park Secondary School since its construction in 1950. The maps show the layout of the same secondary school since the West park Secondary school was constructed in 1950. It is evident that the car parking lot has imcreased significantly since 1980 at the expense of housing and entertaining facilities. From 1950 to 1980, the three rows of house nearby the shool was demolished to make way for building car park and science block. The playround behind the school witnessed the replacement of farmland by sport field. The other physical structure that was added was a main building inside the school yard and still remained as was in 2010. By 2010, It seemed to be more vehicles in the school. Therefore, the car park took over sport field for bigger space .The playround are were unchanged in 2010 but was reduced in size the remaining area was used as sport field. It is clear that the main road remained in place over the period of time. The maps illustrate the developments occurred at West Park Secondary School during a 60-year period from 1950 to 2010. Overall, it is noticeable that the main road stayed the same although it is experienced significant changes such a long time. In addition, there were a dramatical increase in facilities at West Park Secondary School. In 1950, there were three houses located adjacent to the school. A large area behind the school was turned into a playground, while the area behind the houses was farmland. In 1980, these houses had been demolished to make way for the car park. While the school was extended and added to a small science block. In addition, Farmland was converted into sports field and playground remained unchanged. By 2010, the Car Park increased double in size which lead to the reduction in the size of the sports field and playground. However, after 20 years the school and its science block had not been developed too much.